Sorry I haven't been here—picked up a nasty vision-affecting bug last week and then had a thrilling allergic reaction to the medicine that required a trip to the ER. Wahoo! 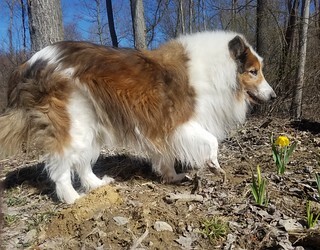 But here is Ben with one of our newly-bloomed daffodils. They've been popping up all week and i couldn't be happier! Plus a few of those planted the previous autumn (our second autumn here) have already begun to naturalize by reproducing themselves! How wonderful is that?